The most classical story in the history of children’s literature, “Alice’s Adventures in Wonderland” was written by Lewis Carroll which is the pseudonym of the Reverend Charles Lutwidge Dodgson. Charles Dodgson is known especially for two children’s books: “Alice‘s Adventures in Wonderland” (1865) and “Through the Looking Glass” (1872). He invented his pen name Lewis Carroll by anglicising the translation of his first two names into the Latin ‘Carolus Lodovicus’. The son of a clergyman Dodgson attended Rugby School and graduated from Christ Church College, Oxford in 1854. Dodgson remained there, lecturing on mathematics and writing treatises and guides for students until 1881. Although he took deacon’s orders in 1861, Dodgson was never ordained a priest, partly, perhaps, because he had discovered other interests. So, what were those other interests? You’d be amazed to find out. 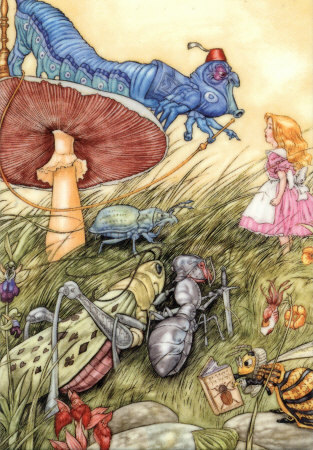 If you are familiar with the story, you probably know what kind of spatial transformations Alice went through after she had followed the White Rabbit and decided to take a magic potion. While it may sound like a fairytale in the book, it’s actually a result one may experience under the influence of drugs. Drugs?! Mostly hallucinogenic mushrooms. That’s how the characters of the story found their way into the fantasy land. Nowadays there are few who would doubt in the (devastating) effects of the use of powerful drugs. Yet, in the case of Dodgson we have an educated man, a professor of mathematics at Oxford, a reverend at Christ Church who in the nineteenth century experimented with psychoactive drugs not only on himself but also on some children he gathered around himself. It turns out that doing drugs was a common practice in Victorian England. Especially commonplace were drugged English babies in the nineteenth century. Back then people’s knowledge about drugs must have been extremely primitive. They were well satisfied with the fact that by doping their children they were able to calm and quiet them. No one can tell what those babies were forced to go through while “at rest” and what influence it might have had on their life. Today we can only speculate on how many addicts were created, how many mental defects caused and how many innocent lives ruined. Dodgson was a scientist. He was not just a drug addict but a devoted expert of science whose primary goal was to study the effects of powerful drugs on human psyche. He had the matter in his hands. He read voraciously. There were hundreds of medical textbooks in his personal library. Dodgson learned from others’ experiences as well as from his own. The effects of doping and curing with drugs were already known these days, what had not yet been studied so thoroughly were the consequences these powerful drugs had in the long run. As he kept experimenting on himself, he probably became a victim of his own scientific studies. Over a five year period, Dodgson suffered from symptoms that have been diagnosed as migraine headaches. During these years he experienced two seizures. Dodgson’s chronic drug dependency is a likely cause of these symptoms. How do you think Mr. Dodgson’s life ended? There are speculations that at the age of 66 Dodgson committed suicide by taking in too large a dose of drugs. For him, his devotion to drug issue became fatal. The unknown has always been an attraction to people. The availability of powerful mind-altering drugs provides an easy access to the unknown for anyone in just minutes. Arising out of the mist and beckoning unto you, the horizons of Wonderland gradually rise into focus. However, what seems to be an adventure may soon become a disaster. For Alice there always was a solution, a way to escape Wonderland. After all, it is a children’s story. But in the real world, for those who decide to take the same path, who eagerly desire to experience and comprehend the unknown by means of drug use, the escape route may not always be granted. Beware of the white rabbit! Haha. The topic sounds vaguely familiar, doesn’t it?